Dynamical Tools returns to meet all the forecasts it had generated before its assistance to Formnext. An evolution of DT600 + printer, the presentation in society of the new jewel in the crown, the SLS, and other surprises, like a beer tap printed in 3D that delighted many of the visitors who approached its stand to savor some typical Spanish products. If there is something characteristic of Frankfurt, it is its colossus Main Tower. A building 200 meters high that for years was the largest structure in Europe and has at the top a viewpoint from which you can see an impressive panorama of the German city. Something similar happened few years ago in the world of 3D printing: a big tower with a lounge bar at the top reserved for a few who did not allow other companies to sit at their table. But the current reality is that the tower does not stop growing and getting bigger. The world of printing is advancing by leaps and bounds, growing exponentially every year and young entrepreneurs and innovative new companies not only have the ambition to sit at the table but also to cut the cake. “All possibilities offered by additive manufacturing to the industry are increasing. Companies are not aware of what 3D printing can help in their production process in areas such as rapid prototyping, tooling or the reduction that can lead to costs and time”, says Ramón Quílez, Dynamical Tools Commercial Director. The growing Aragonese company landed in Frankfurt with a large stand full of enthusiasm and desire to return to triumph in Europe. They exposed two of their DT600+ in which they showed the four possible printing modes. The big size build volume, the two independent extruders, and the high extrusion temperatures were the big lure. Under the slogan “Frankfurt become Orange” and with a big presence in Social Media, the Spanish company attracted lots of people to know their new product. An SLS that did not leave anyone indifferent. A careful and attractive design, an important build volume and an excellent quality / price ratio, following the product line of Dynamical Tools. Pablo Martínez Casedas was present, one of the R & D engineers, one of the most responsibles of this project. During the presentation the Dynamical Tools CMO, Pablo Palacín, wanted to emphasize: “We keep showing that we are an innovative and avant-garde company, we do not stop researching to be able to offer the industry the greatest possibilities in terms of 3D printing”. It was Pablo who was responsible for attending the different communication companies and additive manufacturing blogs that were interested in the new SLS. After the presentation, the Aragonese company wanted to offer a Spanish brunch in which the participants could enjoy typical products of their country. There was many competing companies that came to see the printer that, as of May 2018, will compete with all of them. 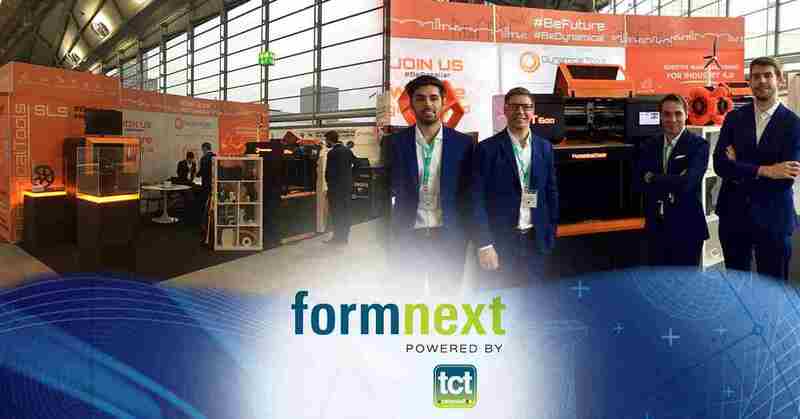 The presence of Dynamical Tools in Formnext had two clear objectives: to keep making its brand known, something that they achieved with great success, and the search for new resellers that make them have presence in most European countries. The numerous contacts obtained and the conversations that are already in process predict a hopeful future for a company that has sold many machines in Spain and will seek in 2018 the jump to the American market.